Polly’s Pumpkin Patch is a small family farm and market owned by Gary Juckem and wife Polly Roland in northeast Wisconsin, just north of Chilton on Highway 57. Polly’s Pumpkin Patch opened in 2003 when we decided to carry on the farming tradition and bought the Juckem family farm. Our family history on the property started in 1889 when Gary’s Great Grandpa John M. Juckem and his wife Johanna bought the farm. Various crops have been grown on the Juckem Farm ever since, by several generations of the family. Polly grew up in Illinois, her Father worked for Del Monte – thus she ate sweet corn every day in the summer! She grew up gardening flowers, vegetables and her parents passion, daylilies – growing over 1100 varieties. In 2004 Polly and Gary started growing and selling sweet corn. Our customers tell us our sweet corn is the best sold in the area. It is extremely tender, sweet and juicy. In 2005, we began selling large quantities of produce from our garden locally. We found that the vegetables sold quickly, as people couldn’t get enough of our fresh, local produce. In 2008 we decided to build our own Market store right next to the fields where our amazing produce and pumpkins are growing. Today and everyday, we feel it’s very important to offer the freshest produce, harvested daily by hand to all our customers. We grow and offer a full line of vegetables. Our store offers our own produce as well as other Wisconsin products including honey, natural maple syrup, cheese, flavored sodas, jam, jelly, pancake and muffin mixes soaps and more. We are known for our great pickle cucumbers and sell bushels and bushels of them for home canning. To see a full list of products we offer click here to visit our Products page. And Polly's is the place to be in the Fall! We have become well known over the years for our wide variety of odd and unusual pumpkins and fall decorations we offer. With over 50 varieties of pumpkins of every shape color and size: white, green, blue, tan, striped, bumpy and orange too! From mini to giant - we grow them all! Gourds of every shape and size are very popular. The more weird, the better! We offer Indian corn, broom corn, straw bales, bundles of corn stalks and fall mums too. Come see our beautiful pumpkin stack! And new in 2011 was our 15 Acre Corn Maze . Click here for more information. We look forward to meeting all of you - friends, relatives, old and new customers! Stop and visit us soon. Gary and Polly and their beloved dog Cleo and our whole crew of cats can’t wait to meet you! 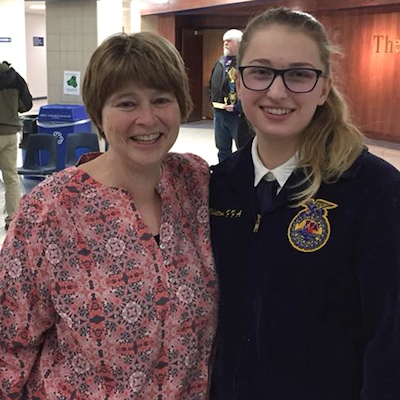 Polly's Pumpkin Patch was recently honored by the Chilton FFA as the recipient of the Distinguished Honor Award. Polly's was recieved because of the outstanding support they provide to the Chilton FFA program. From the annualBlueberryPancake Fundraising breakfast each July to having the Corn maze reconize and support the Agricultureal programs. We at Polly's want to thank them and wish all the seniors good luck in their futures. They are a great group of of young men and ladies!! Polly's Pumpkin Patch was recently featured by Millaine Wells on Midwest Farm Weekly which airs on Channel 5 WFRV in Green Bay. "Usually when we are talking about fall colors, it is the leaves in the spotlight. Well at this family farm, the pumpkins, squash and gourds take a very colorful center stage." For more information on Polly’s Pumpkin Patch, please call 920-849-4819, submit a contact us form or stop by and see us!.